Coral Island has many names including Jezeirat Faraun (Pharaoh’s Island) and Isle de Graye. Some believe that it is biblical Ezion Geber. 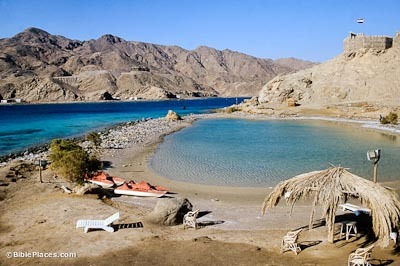 The island is 7 miles (11 km) south of Eilat in Egyptian waters. 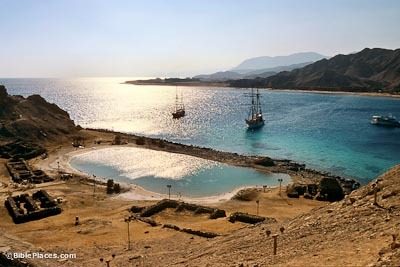 The waters between the island and the Sinai mainland are a natural anchorage, protecting ships from the rough storms on the Gulf. 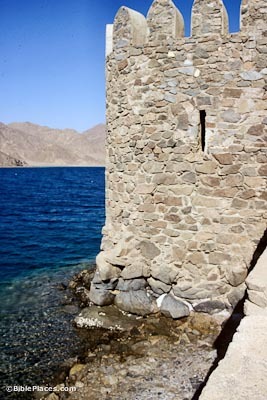 The breakwater here was created by silt from Wadi Jereya. 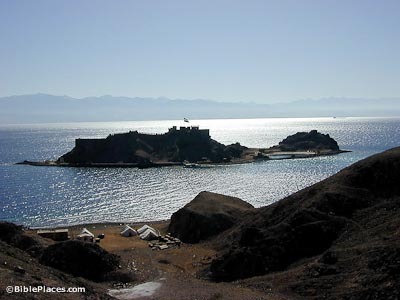 A Muslim fortress has the best position on the island, commanding the northern hill. It was probably built by Saladin in 1170. The two southern hills have Byzantine ruins. The Coral Island Harbor was obviously a busy port at one time, as shown by the large buildings near harbor and a slipway now under the water on harbor’s northeast edge. Remains of two “dolphins,” (building stones used as offshore piers) are underwater just outside the harbor. Goods were then ferried across to jetties on the mainland, from where they could be sent northward on land. The harbor is relatively small – 180 by 90 feet. This small bay was converted into a protected anchorage in the past. Today the bay is blocked off from the ocean by the breakwater. David Roberts drew what appears to be a lighthouse on the southern end of the island in 1839. Its remains are no longer visible. A casemate wall and its nine towers going around perimeter may date to Solomonic times, though some scholars date them to the Byzantine Age. Most of the pottery found on the sea bottom is from the late Roman and Byzantine periods. Rothenberg found some pottery on the island in 1972 that dated to Iron I (1200-930 BC). The foundation of the tower depicted at right is the only architectural evidence that may be from the time of Solomon. 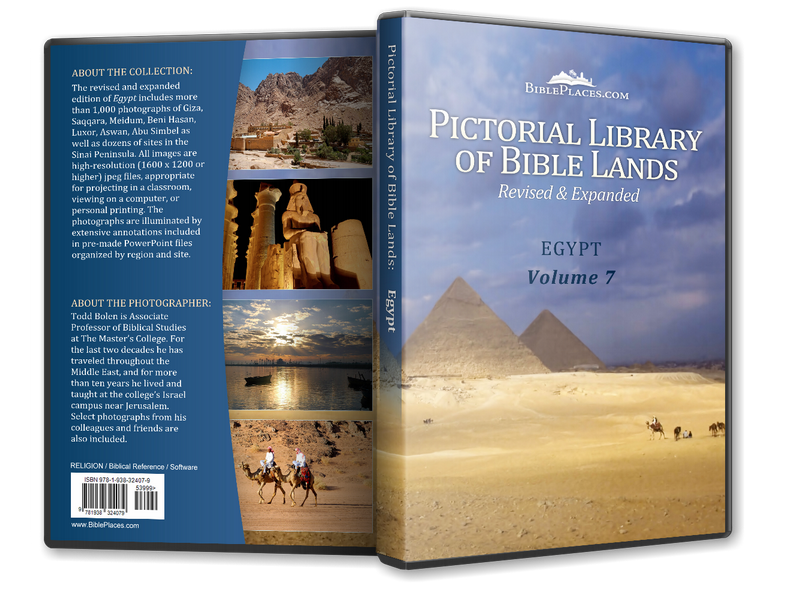 The desire to identify this island with Ezion Geber in the biblical period is the lack of a better alternative. Solomon’s maritime activity is described in 1 Kings 9 and 2 Chronicles 8. He built a fleet of ships that traveled on three-year long expeditions which brought back such treasures as gold, silver, ivory, apes and peacocks.